A photo taken of Saturn by the Cassini spacecraft, which has been exploring the Saturn system for 10 years. Image uploaded June 30, 2014. A NASA spacecraft marks a big milestone today (June 30) — a decade exploring Saturn and its many moons. Since arriving in orbit around Saturn 10 years ago today, the Cassini probe has made a number of unprecedented observations and discoveries. Although the spacecraft was originally approved for a four-year mission, it has been granted three mission extensions, allowing it to continue roaming the gas giant’s system. For example, Cassini has helped scientists learn more about what kinds of molecules populate our solar system. The spacecraft discovered plumes containing water-ice shooting out into space from the south polar region of Saturn’s moon Enceladus. The Enceladus discovery is one of Cassini’s most remarkable findings because it marked an extension of the search for life in the solar system, NASA officials said. Researchers know that life as we understand it relies on water, so finding the substance on a moon or planet could be a sign that life might be able to exist there. Scientists now think that Enceldus harbors an underground ocean. Enceladus wasn’t the only mysterious moon Cassini helped reveal. Saturn’s huge satellite Titan has also been studied by the long-lasting orbiter. Cassini’s measurements have shown that Titan has rain, lakes, seas and rivers like Earth, NASA officials said. Unlike Earth, however, Titan is a cold world with seas of liquid methane rather than water. The Titan-exploring Huygens probe also launched to the Saturn system with Cassini in October 1997. The European Space Agency’s Huygens robot landed on Titan in 2005 and became the first manmade craft to land on a moon in the outer solar system. It measured the atmosphere and beamed images of the moon back to Earth. 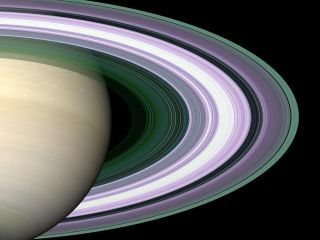 Cassini has also unveiled how Saturn’s rings change over time, and because of its long tenure in the planetary system, the probe has observed seasonal changes taking place on the planet and its moons, according to NASA. Cassini will continue to beam back data to Earth for a few more years, until 2017 when it is scheduled to intentionally plunge into Saturn’s atmosphere, ending its mission.